I don’t know about you, but when somebody mentions the name ‘Merlin’, an image of a bearded sorcerer pops straight into my mind, quickly followed by King Arthur and several valiant Knights of the Round Table. Add a couple of fire-breathing dragons, a gleaming but inaccessible sword, and a darkly beautiful villainess, and by this time I’m probably thinking about re-watching the excellent TV series starring Colin Morgan in the title role. I have always been interested in the theories about the origins of Merlin, the wizard or wise man in King Arthur’s court, just as much as the similar, often interconnected theories about the existence of the king himself. And Merlin, of course, is said to have dwelt in a crystal cave. For me, that gives him the edge. Scotland’s Merlin? Does Scotland really have a claim to him? When so many places connected with Arthur – Tintagel, Cadbury, Glastonbury, Caerleon – lie in Wales or the south of England? It seems that it does, but the connection has its roots in a time before the emergence of Scotland itself. Tim Clarkson always – very rightly – points out the futility of viewing early medieval history through the lens of modern national identity, and then he gets on with examining the evidence in fascinating detail. I am not going to reveal all his findings in this review, partly because I would like you to read the book and discover them for yourself. I found Tim’s background explanations just as interesting as the main strand of the argument, taking in the contents of wonderful manuscripts whose names are more than enough to lure you down a misty path: the Black Book of Carmarthen, the Red Book of Hergest, the White Book of Rhydderch; and the writings of Geoffrey of Monmouth, Robert de Boron and Sir Thomas Malory, all of whom sound as if they deserve a supporting role in the legend themselves. This is an important point to make. Merlin’s name seems to have been a creation of the 12th century writer Geoffrey of Monmouth, who drew information from much older sources – many of them now lost – for inclusion in his Historia Regum Britanniae (‘History of the Kings of Britain’). Geoffrey’s works, Prophetiae Merlini (‘The Prophecies of Merlin’, c.1130) and Vita Merlini (‘The Life of Merlin,’ c. 1150) gave birth to the legend, and are largely responsible for the figure of Merlin as we know him today. But did the character behind the name exist much earlier – as long ago as the sixth century? There are many tantalising clues. Tim Clarkson carefully examines the conflicting identities of Merlin (or a Merlin-archetype), as presented by medieval chroniclers. From these, we can be persuaded that Merlin was a druid, a prophet or an elder; was the trusted bard to a king in Dark Age Britain; was a pseudonym for a Romano-British warlord, Ambrosius Aurelianus (Emrys); or a recluse, living in ‘the dense-wooded valleys of the Forest of Calidon’. It is in this last guise, as ‘Myrddin Wyllt’ or ‘Merlin the wild man’, that Tim takes us deeper into the past. Looking again at Vita Merlini, Tim Clarkson relates the story of Merlin as he accompanies his king to the Battle of Arfderydd. Horrified by the scenes of slaughter, and grief-stricken beyond words at the death of so many of his beloved friends, Merlin is overcome with madness and runs away into the forest, where he lives for several years in solitude, evading capture and lamenting his fate. Search parties catch up with him eventually, and he is brought – unwillingly – back to court, where he utters several prophecies that prove to be as accurate as they are clever. It’s easy to be distracted by the utterings of Merlin (or of Geoffrey, because of course he is speaking for him). Nor is the ‘wild man’ story particularly unique, as Tim explains that it occurs in several different cultures. In the annals of Britain and Ireland alone, there are five different versions of this ‘wild man’, who may – or may not – be one and the same. The pursuit of just one of these, I can imagine, would demand months of careful research. What interests Tim most specifically is the appearance of a shadowy figure in the writings of Jocelin, a twelfth-century monk who lived at Furness Abbey in north-west England. Jocelin’s role was a hagiographer: in other words, he was a biographer of saints. One of his subjects was St Kentigern, the patron saint of Glasgow, and he completed his work, known as Vita Kentigerni, around 1180. No one ever really explained the difference between fact and fiction to writers in early medieval times. To them, the boundary between the two was both blurred and entirely flexible: if the story reflected well on their subjects, so much the better. Therefore, through Jocelin’s narrative, we have St Kentigern grappling with all kinds of hostile paganism, in his mission to bring light and Christianity to the dark places of Scotland. He travelled to Wales, where he met St David; and then, returning to his home turf, he met St Columba, and the two exchanged croziers, because that’s how they rolled. Jocelin didn’t say it quite like that. Ah, no! But it was such a lovely picture! Back to Merlin, and the crux of the matter is this. We glimpse him – or perhaps his earliest incarnation – in the court of King Rederech, as a jester or a fool who, after the death of St Kentigern, “gave himself up to the most extreme grief and would receive no consolation from anyone.” The name of the fool was Laloecen. Now, ‘Laloecen’ sounds nothing like ‘Merlin’, but his story is intriguingly similar. Tim Clarkson examines other contemporary documents, such as a text called Vita Merlini Sylvestris or ‘The Life of Merlin of the Forest’, in which St Kentigern confronts a madman by the name of Lailoken. Lailoken has the gift of second sight, and talks in riddles; he lives alone in the forest and appears to St Kentigern several times, eventually predicting his own ‘triple death’. Tim has collected all the fleeting references to Laloecen or Lailoken, and lays them out for examination. The continuity in the Merlin legend is convincing, as is the suggested derivation of the name ‘Laloecen’ itself. At the same time, he looks at the possible locations of the Battle of Arfderydd, where Merlin lost his mind. Several clues point to the hills of the Scottish Borders, and the names of the protagonists, in all their variously-spelled guises, have just enough historical credibility to back it up. It all makes for a complex but fascinating read. This is not the first time that a Scottish-based Merlin has been proposed, but Tim’s in-depth knowledge of early medieval Britain, in particular the kings, cultures and settlements of Strathclyde and northern England, means that he is better placed than most to tease out the fine strands of truth from a dauntingly tangled ball of threads. He is also very conversant with a whole panoply of medieval documents, and guides us through them with ease and skill. I’ve reviewed another of Tim’s books here on The Hazel Tree (‘Strathclyde and the Anglo-Saxons in the Viking Age’) and this new offering has just the same quality of presentation, clarity and thoroughness. The main challenge of Tim’s task, which I think I’m I have only barely glimpsed, is the fact that so many of these medieval texts stand on foundations that we can no longer see; one, for example, dating from the twelfth century, could be based on several others, perhaps two or four hundred years older, of which the original manuscripts are now lost; fragments of the originals might survive, but these might have evolved separately, into highly embellished stories of their own, each containing a haze of fantasy revolving around a small nucleus of truth. It must feel like fishing for tadpoles with a tennis racquet. Added to this, we have the vagaries of early medieval writers with their own inherent love of myth and legend, and the powerful kings who paid them well in order to spread their fame. Alongside their heroic deeds, warlords wanted to be seen as cultured, wise and well-read, generous sponsors of music and poetry. No wonder that legend, in the collective consciousness of their people, was indistinguishable from fact. I haven’t even mentioned the other complication, which is that the manuscripts themselves are written in a medieval language such as Old Welsh. I can’t help being charmed by the names of the people: besides Merlin or Myrddin, we have the warlords Rhydderch Hael and Gwenddolau, Vortigern, Gwrgi and Peredur; Gwenddydd, a possible sister of Merlin; the bards Taliesin and Aneirin. You can imagine them in a song, or a long story told around a camp fire. I hadn’t even heard of the Battle of Arfderydd, but that kind of landscape detective work is just the kind of thing I enjoy. For me, it is this argument that has the edge in placing Merlin in Scotland, but I will leave you to read about it and reach your own conclusions. So, was Merlin a sorcerer who miraculously moved Stonehenge across the Irish Sea and arranged the conception of King Arthur? Was he a wise man, a seer of fate? A jester in the court of a Scottish king? A mercenary who was traumatised by battle and went out of his mind? The thing is, we shall never know, and the delight lies in the mystery. Merlin haunts the landscape like a shade, and we’ll never catch him. But, thanks to Tim Clarkson, we can enjoy the search. 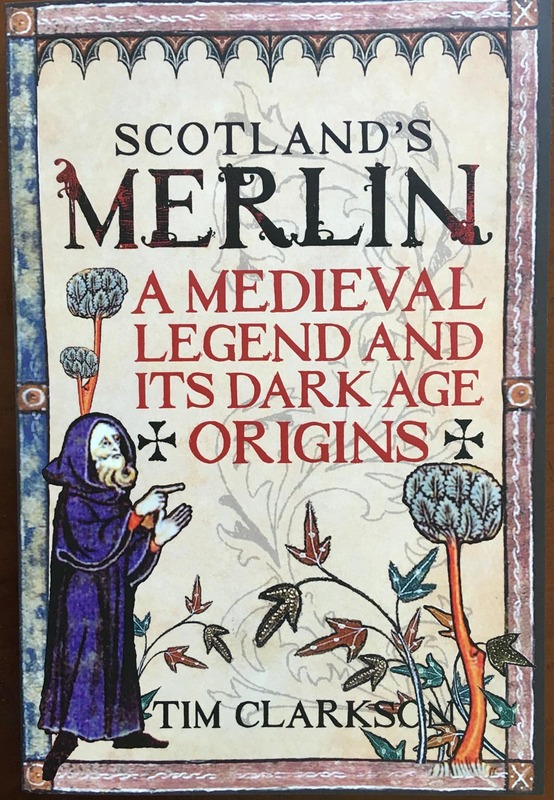 ‘Scotland’s Merlin: A Medieval Legend and its Dark Age Origins’ is published by Birlinn and is priced at £14.99. The book is softback, nicely designed, with occasional maps and a central section of black-and-white photos. That’s a very good analogy, Pat! Tim has done a brilliant job with what seems like an impossibly complex array of sources. His argument is fascinating and convincing. Thank you thank you thank you for this Jo! I love reading anything remotely related to King Arthur and on my last visit to England in 2010 I took a trike tour which visited a few sites that are associated with the legendary king. 🙂 I’m going to add this to my book of books. Very welcome! 🙂 That sounds like a fun trip! I would love to visit some of those sites myself. Glad you’re adding it to your reading list! I think I’d always imagined Merlin as a mythical figure rather than a real person, but then myths are often based on reality, aren’t they? It sounds like a mammoth job, writing a book like this, so hats off to Tim Clarkson. I like your idea of catching tadpoles with a tennis racquet. 🙂 Incidentally, I thought I had left a comment yesterday, but apparently not (I’m having a lot of broadband trouble).